"the size of and distance between park features is not adequate for bikes, given their greater size and speed. Therefore, the risk of collision between bikers and skaters is high. Moreover, BMX pegs will damage ordinary concrete and coping surfaces. With skateboards, the coping typically wears down the board's trucks, not the other way around." Sounds like some bike hate BS pulled straight off the pages of Concrete Disciples to me! Anyone claiming skate trucks don't destroy concrete is just plain misinformed! After checking out the park I do agree that steel BMX pegs would kill that place, but what about PLEGS or letting in bikes with no pegs. 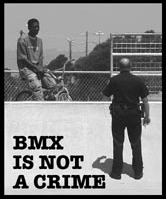 Instead they'll uphold their ban, create a lot more tension in the skate and BMX community, and they're going to have bike vs. skater issues at the park on a regular basis. So lame in so many ways! Why can't we all just get along? The new Windsor Locks park allows bikes, Hartford is gonna allow bikes, Middletown is gonna allow bikes....what's the deal Middlefield?? ?